The Dodge Ram is a leader amongst its competition. The pickup truck has plenty of muscle, and it has several optional features. For 2018, the popular brand has a large selection of impressive trucks. The new Dodge Rams are stylish and functional. The Ram added a luxury model to its newest line of trucks. Ram enthusiasts will love the 2018 Ram 1500 Limited Tungsten. The newest Dodge Ram pickup truck has a combination of wood trim, upgraded leather and synthetic suede. The rearview camera is now standard. Android Auto and Apple CarPlay are now included in the infotainment system. The Dodge Ram sport also has a few new tweaks. Many consider the Dodge Ram to be the muscle car of trucks, due to its striking looks and performance. The Ram has an engine that is perfect for each trim. Many drivers prefer diesel engines. The EcoDiesel engine is an optional feature in some Rams. For most Rams, a 3.6-liter V6 is the standard engine. The 5.7-liter V8 is standard on the Limited trims and the Laramie Longhorn. Unlike its competitors, the Ram utilizes a coil-spring rear suspension system. The setup gives the truck more stability on bumpy roads. The Ram has several customization options. The truck has nearly two dozen wheel options. The infotainment system is available with a basic AM/FM radio for work-oriented trucks. Luxury models have advanced infotainment systems. The truck has impressive exterior and interior styling. The tailgate has an integrated spoiler. Basic Tradesman trims have steel wheels and unpainted bumpers. The Express trims have color-matched grilles and bumpers. They also have 20-inch alloy wheels. The Laramie trim has a two-tone color. For more luxury, consider the Big Horn. The trim has some chrome. The Ram Rebel has matte black graphics and an unpainted grille. 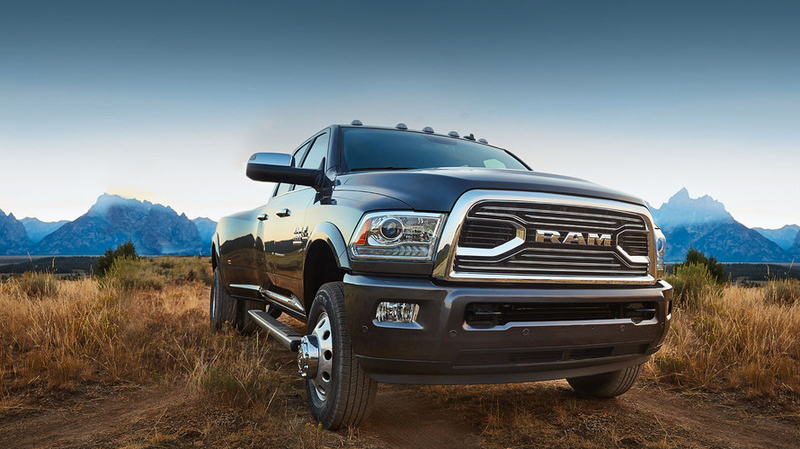 Depending on the model, the Ram can be ordered in extended cab or regular cab. All trims have a symmetrical dashboard. Luxury models have wood trim and chrome. The work-oriented trucks have rubber floors. A large center armrest is standard in all trims. A fixed console and individual captain’s chairs are optional features. All Rams have a supportive front seat. In the crew cabs, rear seat passengers have plenty of space. The Ram has lockable storage units in the rails. The cabin has several storage bins. All trims have stability control, anti-lock brakes and six airbags. Higher level trims have parking sensors. The Ram 1500 has a great fuel-economy. The Ram 2500 has a more powerful engine. For off-road driving, the 4X4 is a great choice. The HD/heavy duty trucks are great for pulling heavy loads. Most consumers will be interested in the Ram Express. The trim is very basic. However, a 5.0 audio system and Bluetooth are optional features. Most trims can be equipped with several optional features. The trailer towing kit and the cargo storage system are popular options. The newest Dodge Ram might be the perfect truck for you. Your local dealer can help you find a stylish and reliable Dodge Ram.